I have always loved playing the game of Tetris. I thought it would be fun to create a Homemade Tetris Costume for Halloween. The difficult part was figuring out what kind of boxes to use because they had to be the same size. I went with medium sized u-haul boxes. It took 4 boxes for each costume. Initially, I cut the flaps off the boxes. Then I used spray paint to coat the outside. Two coats were needed for the lighter colors. The technical part was using the black duck tape to assemble the Tetris pieces. This was the longest process because all the lines had to be perfect. Overall this process took about 4 hours to make. It was a fun experience. The final stage was cutting the face and armholes. 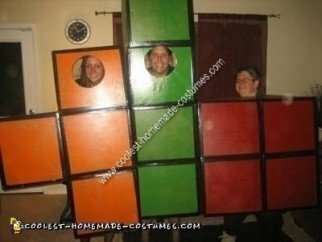 The Tetris pieces were an exciting costume to build and the first homemade costume I have ever made. I would say it is an inexpensive and easy costume to construct. I love your costume! It so detailed, and so cool that the pieces all fit together! Bravo!